Third Rail Devil. This print is a depiction of the iconic Third Rail Clothing log. The company started in 1989 and was an innovator of Streetwear. Risk started the company as a means to support himself and pay the rent for his decrepit Hollywood studio. As other graft related companies started Risk attacked them and as he says "exposed them for who they were" and adopted the devil logo. 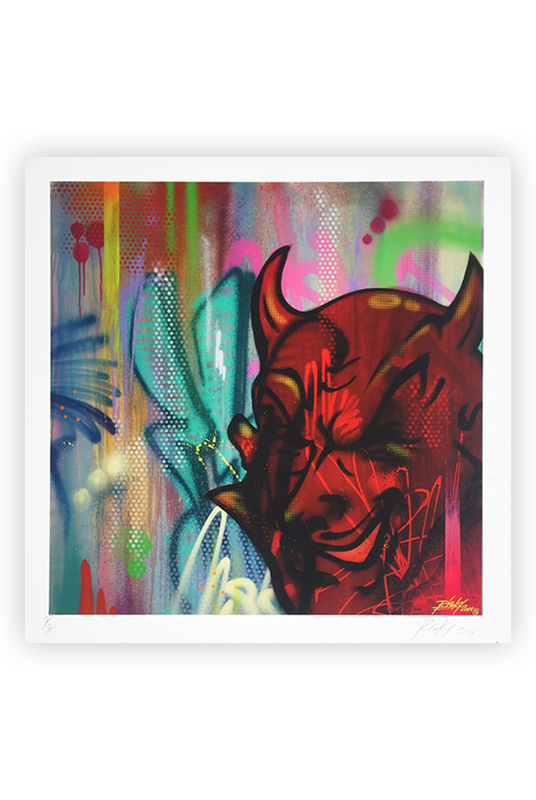 Medium: 7 Color Serigraph on 320 GSM coventry rag fine art paper printed with archival inks. Each print comes with a certificate of authenticity from Risk. Serigraphs printed at Seriopress in Los Angeles.